Lilygun adheres to no rules. 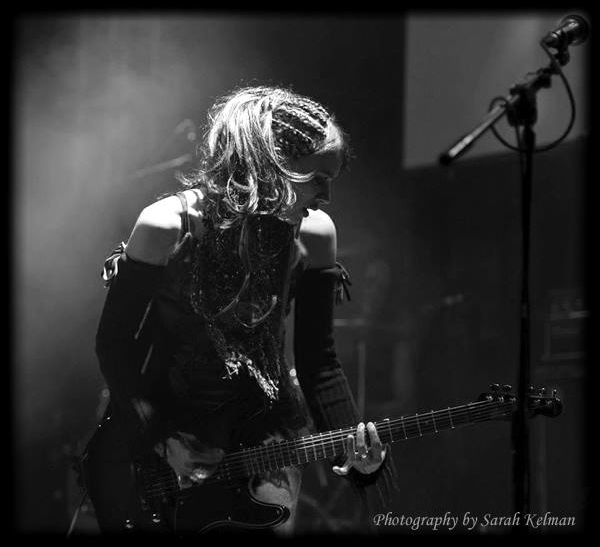 A guitar based rock band, Lilygun was formed by the enigmatic singer/songwriter/guitarist Anna-Christina. Her unusual combination of classical roots mixed with dark aggression has resulted in an uncompromising and unpredictable Rock that has an edge to it and has been described as "a shower of bullets and petals". On Lilygun’s climb to success, the singer suffered a Subarachnoid Brain Haemorrhage. The shock hit hard. Her life stood on a knife's blade for a few deadly months but it was not to be the end. Lilygun is a band free from rules, fashion trends and the common trappings of most rock bands. Not willing to submit to the norm, Lilygun has the ability to create a strange and captivating atmosphere when playing live. When the question arises of whom or what they are like, it's always met with the same reply, "I dunno"! The name "Lilygun" was just two words thrown together at first but as the band progressed, it took on a meaning all on its own. It's a perfect representation of the many contradictions the band has. Something beautiful inverted into darkness. Aggressive and heavy in parts of the songs they play to soft and fragile. All projected with a sense of glamour and a certain freshness and vibe of their own. After the success of the band's first two singles, notably the second single Moonlight receiving rave reviews, making XFM's Playlist on the Ian Camfield Rock Show and a nomination for a Pure Rawk Award for ‘Best Single of the Year’, Lilygun's self-titled debut album was released in 2012. The critically acclaimed album received outstanding reviews from a cross section of reviewers and DJs, from Rock to Pop, Metal to Goth and Alternative magazines and websites. Lilygun had a full page article featured in the Observer newspaper. The album was aired regularly on radio and podcasts both in the UK and abroad long after its release. Lilygun made ‘Band of the Month’ and ‘Album of the Year’ on several websites and landed Special Features. Over the years, Lilygun managed to build up a solid and loyal following and their shows pulled a healthy London crowd. This meant that they were able to perform at all the popular London venues including some of the larger ones such as 02 Islington Academy and the Scala. Between 2013 - 2015 Lilygun took a short break while Anna-Christina released her solo acoustic EP Pretty Little Lady? and branched out as a film/TV/media composer and a business owner. In 2016 Lilygun released the much anticipated first single Inside, from their second album. A music video accompanied the release. Lilygun proved to not only be unique in sound but also in vision. Anna-Christina’s raw and powerful performance style was captured in the video. The singer was delighted when a reviewer described her as “a Gothic Kate Bush”. On 17/7/17 the band released their second album Strength & Grace as a Limited edition CD. Within six days of its release, the album sold out. A testament to their continued popularity, despite the lack of live shows in recent years. Lilygun’s history is one of great turbulence and the road to success was a difficult one. Twenty five band members, gigs without drummers turning up, health issues, racism, sexism, heartbreak and an industry trying to change original into ‘run of the mill’. Lilygun simply won’t fit in a box! However Anna-Christina's persistence has resulted in deserved success. “Lilygun was once hailed as the next big British rock band and although we’ve won the hearts of critics and fans around the world, the music industry wants bands they know how to market. I was told my image isn’t appealing and my attitude is wrong, just because I'm different and unafraid to be so. I now know, that many would beg to differ! From the beginning, I had a vision and I'm very proud of the fact that I didn’t conform to anyone else's expectations or opinions or let the many previous band members of Lilygun ruin my spirit. I've built Lilygun's world on my terms and no one tells me what to do! Anna-Christina's music career began when she won a scholarship to attend a performing arts boarding school. She grew up in a highly competitive, hard working, isolated and at times nasty environment but these claustrophobic confines led her to a special talent that was brewing inside her head - music. At the age of 12, she began playing the piano. "I was always locked away in a tiny music cell at my school by myself playing the piano and writing songs like a sad git! I was an outcast but it never bothered me because I always had somewhere to go, that tiny music cell is where everything began for me". She turned her full attention to music and gave up her theatre life for Rock'n'Roll. Her unconventional upbringing was the perfect preparation for what was about to come. Creating Lilygun was not an easy affair and there were many changes that needed to be made for her vision to come to light. Through all the difficult struggles and highly questionable people she met on the way, she was always in the middle of the madness, her ambition overcoming all obstacles. When Lilygun was finally ready to be exposed to the world, fate took a dark twist. Anna-Christina almost lost her life after suffering from a Subarachnoid Brain Haemorrhage. An event that would change her forever but didn't stop her from pursuing that one thing that kept her spirit alive in the hard months of illness - music. Her life stood on a knife's blade for a few deadly months but it was not to be the end. Her operation and recovery was a miracle, though there were many gruelling years ahead, it was confirmed that Lilygun would see the light of day. "I had to overcome Post Traumatic Stress and depression. I suffered nightmares and a total fear of leaving my house alone. Weather changes caused extreme pain to my scar and I battled constantly with very painful headaches. I spent the next few years on strong painkillers and though my brain was functioning normally, it was as though I was doing EVERYTHING for the first time in my life. It was devastating. People told me I wouldn't be able to continue my career as a musician but I was determined to prove them wrong and I did". After her recovery, she was back, better than ever and stealing more hearts. Not only did Anna-Christina bring Lilygun back to life in the years to follow, she also joined The Eden House as a lead vocalist throughout 2010 on their European tour. She sang to a crowd of 1500 when they performed at Castle Party - the biggest Goth and Darkwave festival in Eastern Europe, Poland. She performed to 2000 people at Waregem Gothic Festival held in Belgium and DV8 Festival in York, which is one of the UK’s top alternative festivals. There were also a string of successful shows in London. The charismatic singer is involved in several other projects. She recorded vocals on Boy of The Afterthought's debut album and performed and recorded bass in David Ryder Prangley's band The Witches. She also plays bass in Sister Witch. Anna-Christina has been described as "Multi-talented" and is also an entrepreneur and runs her own company. She is a published children's audio book author and a TV, film and media composer. Belle is a familiar figure on the London rock and alternative scene. 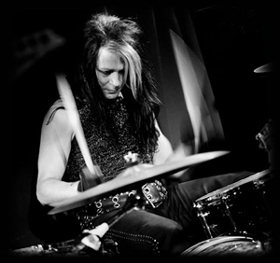 He has worked as a drummer/percussionist for a large number of bands and artistes and he has done a considerable amount of production and mixing-related work for a number of bands and projects. 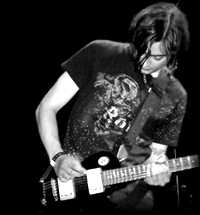 Additionally he is noted for his work as a top dj for a number of rock and alternative clubs. In addition to Lilygun, Belle is currently playing drums for Partly Faithful, Nosferatu, The Cureheads and Glam Rock Youth Club. His past credits include Killing Miranda, Rachel Stamp and Lahannya. He is noted for his tight and hard-hitting style of drumming and for the fact that he always 'plays for the song', rather than swamping the music with too many excess beats. Known for his individual appearance and love of glamour, Belle also enjoys alcohol in copious quantities, women of various types, foreign travel and a wide variety of music and aspects of both alternative and mainstream culture. He is known as an advocate of vegetarianism and for his support of women's rights and gender equality. Furthermore he is a supporter of many charities, including those such as Amnesty and others who speak out for oppressed minorities. Belle is currently taking bookings for weddings, parties, christenings, wakes and barmitzvahs because 'variety is the spice of life'. Aaron John has on occasion played both lead guitar and bass in Lilygun at live performances and on recordings over the past few years and is one of two bass players featured on Lilygun's debut album. He became a key ingredient in the development of Lilygun's sound of today. 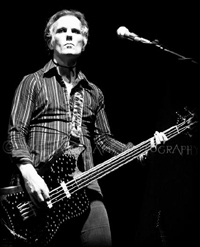 David Ryder Prangley is a musician best known for his work with the glam punk rock band Rachel Stamp. He works with many bands and artists as a producer and produced Lilygun's first single 'Diamonds'. 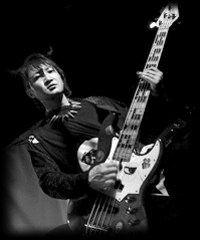 He was Lilygun's special guest bass player during 2012, joining the band on stage for a string of album promotional gigs as well as recording on their debut album. 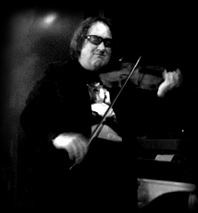 Bob Loveday, British rock violinist - recording session and performing artist, has worked with a myriad of artists, including Van Morrison, Penguin Café Orchestra, Bob Geldof, Jeff Beck, Kirsty MacColl and Rachid Taha, amongst others. He recorded violin on 'My Ways' and 'Moonlight' with Lilygun. This talented bass player joined Anna-Christina at the beginning stages of Lilygun and helped build the band up from nothing. He was a key member in Lilygun for many years and played on many recordings including their first single 'Diamonds' and the EP 'Peace of Mind' released in 2010, which he also co-produced and recorded with Anna-Christina.